I have a replacement. Have two of everything. But I found this titanium replacement clip. Anyone have experience with these? Yes. I thought it was a bit expensive but it was cheaper than a new knife. It worked fine for a year or so until I lost the knife about a month ago. A good spring should not fail like that. As for titanium, it’s got geek appeal but I haven’t heard of titanium as a logical choice for springs. SOG has a free clip replacement form on their website. Maybe Spyderco has something similar? Generally, I think clips are the most poorly engineered things on knives (and flashlights). 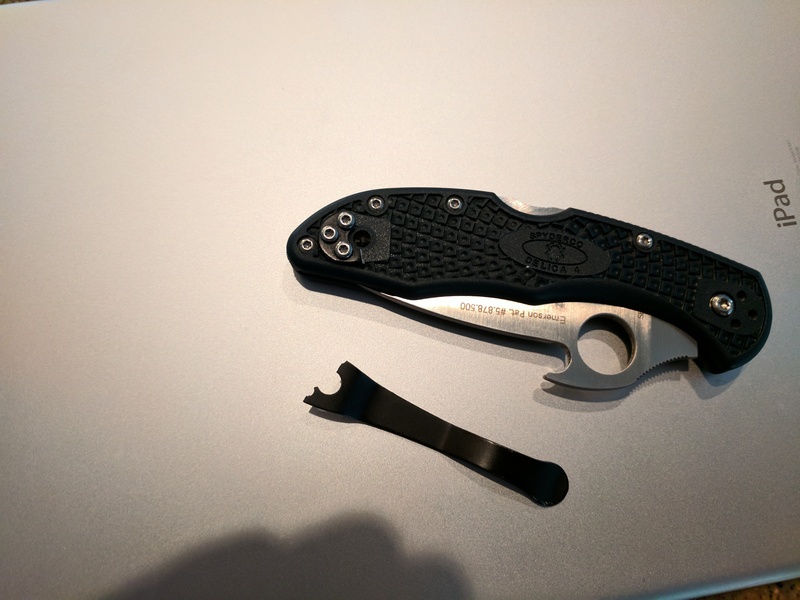 But how many EDC things do you loose because of the clip vs them breaking? Make better clips! I have a few of the Lynch Northwest Titanium clips. I like them just fine, coming up on 2 years of use. 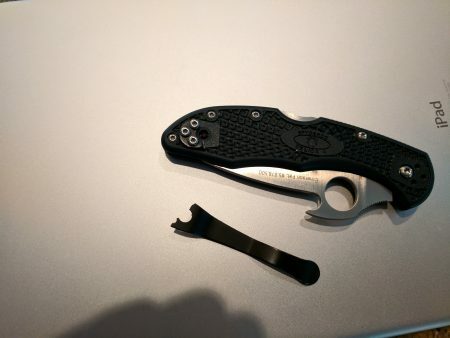 Spyderco does not replace those factory clips for free, BTW. I checked, bought a replacement, and when it broke, went to Titanium. I believe the one I have is a different brand, but I like it. Not so much for the titanium aspect, I would be happy with a cheaper stainless version, but the fact that it rides much lower in the pocket. Works for me. That hole in the highest stress flex area is the problem. That is a design flaw. Poor engineering. Note that the aftermarket replacement part doesn’t make that mistake. I installed a Blade4Sell black titanium pocket clip on my PMII three months ago. Quality and finish seem good and no problems with function thus far. Ordered through Amazon, though, the wait time to receive it was the better part of two months. Check out PopsCustomClips on Etsy. Hand made Ti clips with different designs and finishes. Delica well supported. I have a Benchmade Titanium frame linerlock. That part of the frame flexes very well (twenty years old). IIRC, titanium is inherently springy, much more than steel. That attribute has to be considered when designing parts, especially load-bearing items used in aircraft.